The Pantera 7 Speed Beach Cruiser is a Pantera with all the benefits of multiple speeds, for climbing that steep hill or just cruising down a flat street. �Features include a Shimano 7-speed derailleur system, front and rear alloy v-brakes, 7-speed Shimano grip shifter, a dual-spring comfort seat, extra-wide handle bars and 26" whitewall tires. The wheel size is 26" and the frame is 17". 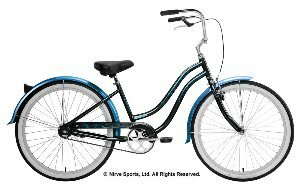 This 26" cruiser is perfect for those who are between 5'3" and 6 'tall. 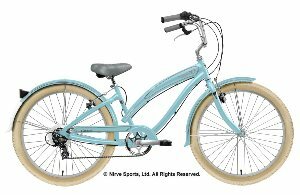 The Tahiti NX3 3 Speed Beach Cruiser is a Tahiti with all the benefits of multiple speeds, for climbing that steep hill or just cruising down a flat street.� Features include a Shimano� Nexus 3-speed derailleur system, which has an integrated a coaster brake, 3-speed Shimano Nexus shifter, a dual-spring comfort seat, extra-wide handle bars and 26" whitewall tires. 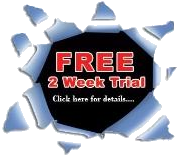 The easy to use pedal (coaster) brake is standard. The wheel size is 26" and the frame is 17". 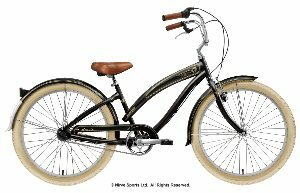 This 26" cruiser is perfect for those who are between 5'3" and 6 'tall. The Micargi�Tahiti Beach Cruiser is a nice alternative to the basic cruiser, while offering the same great classic frame design the Tahiti has upgrades that make this cruiser very appealing. 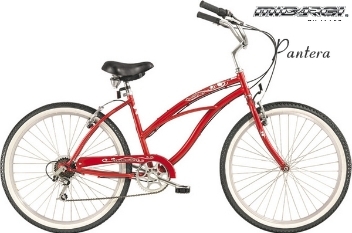 The Tahiti bicycle comes standard with red rims and front and rear fenders. 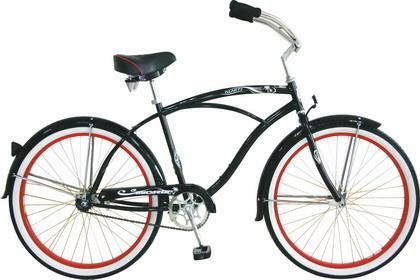 Single speed beach cruiser is equipped with coaster foot brake and strong steel fork suspension. The Pantera 24" for women is a stylish beach cruiser with one gear to get you where you want to go and features an easy to use pedal brake. 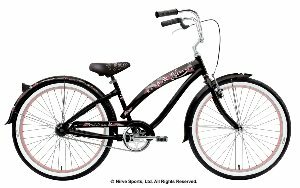 The 24" Pantera Beach Cruiser� is the same as the Women's Full size Pantera only it features smaller wheels and a smaller frame. The wheel size is 24" and the frame is 15". This 24' cruiser is perfect for those who are 5' 1" tall and under. 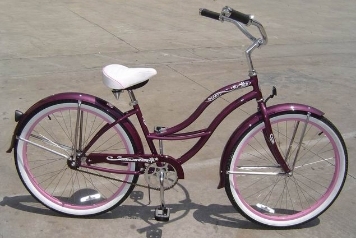 Color-matched fenders are avilable to be purchased and added to this bike to give it just a little something extra. 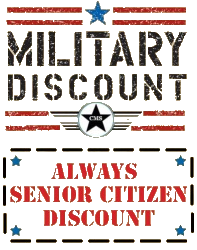 Offered in a variety of� different colors there is sure to be a color thst suits your personal style. 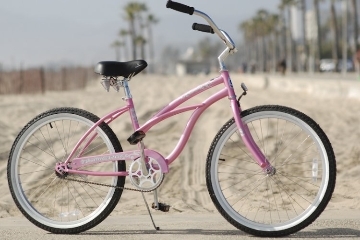 The 24" Pantera cruiser is also a stylish beach cruiser at an affordable price. The Pantera features flower decals that are easily removable if you wish. Assembly = front wheel, handlebar, seat and fenders. 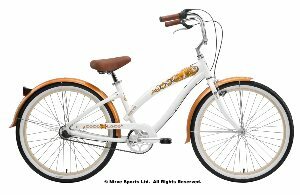 Experience true beach style on the Micargi Tahiti beach cruiser bike. 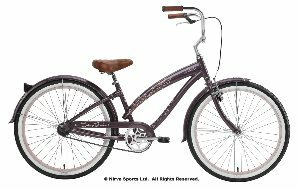 The Micargi Tahiti features a double-spring seat, and color-matched fenders, classic cruiser frame style, upgraded foam star grips. 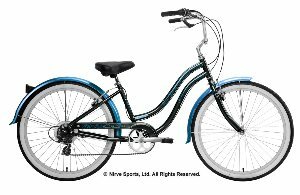 Plus, the easy-pedaling aluminum wheels have cool white wall tires, which make it easy to ride this cute bike anywhere. 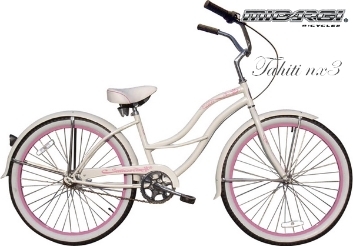 Special Note: The Tahiti beach cruiser is available in Pink or White with Pink accents, Vanilla with Pink Wheels. 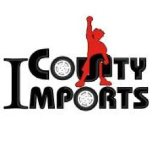 Black with Pink Wheels, Mint Green with Mint Green Wheels, and Baby Blue, Metallic Midnight Blue with Alloy Rims, Flat Artichoke Green with Vanilla Rims, Flat Black with Red Rims.